Llactapata (also spelled Llaqtapata), means in the Quechua language the ”Town on the Hillside”, but this is a new name, nobody remembers anymore the old Inca name, it’s forgotten in time. 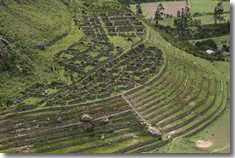 Llactapata is an ancient Incan village with a number of farming terraces. It is located on a height of 2.600 metres, in the Cusichaca river at roughly the entrance to the Vilcabamba jungle. Hiram Bingham first discovered Llactapata during his excavation of Machu Picchu in 1912 and the described it as "the ruins of an Inca castle". Llactapata dominates the Kusichaca valley and was in the Inca day most likely an administrative place also divided in the 3 classical parts. You have the religious area with the temples, the agricultural area and a living area. They received the goods from the jungle and transported them further towards Cusco. Peru hiking tours to Llactapata a highly rewarding holiday choice!